Photo courtesy of Walk Bike Long Beach of attendees at the Reimagine the Anaheim Corridor event. Walk Bike Long Beach (WBLB), a local chapter of the Los Angeles County Bicycle Coalition (LACBC) focused on improving the walkability and bikeability of the city, released an end-of-year update on its 2017 progress. In just two short years, the organization has led numerous efforts in making the greater Long Beach area a safer place to walk and bike. WBLB kicked off 2017 by attending the E-Bike Festival at the Long Beach Convention & Entertainment Center in February and raffling off a $4,000 Tempo E-Bike, with all ticket proceeds going toward the organization’s efforts. “For many of us it was our first real exposure to e-bikes and how they could play a role in making bicycling accessible to an even larger audience and how it could help in transitioning drivers from their cars onto bikes,” the release stated. In July, WBLB hosted an event where community members were invited to reimagine Anaheim Street, one of the most accident-prone areas in the city. 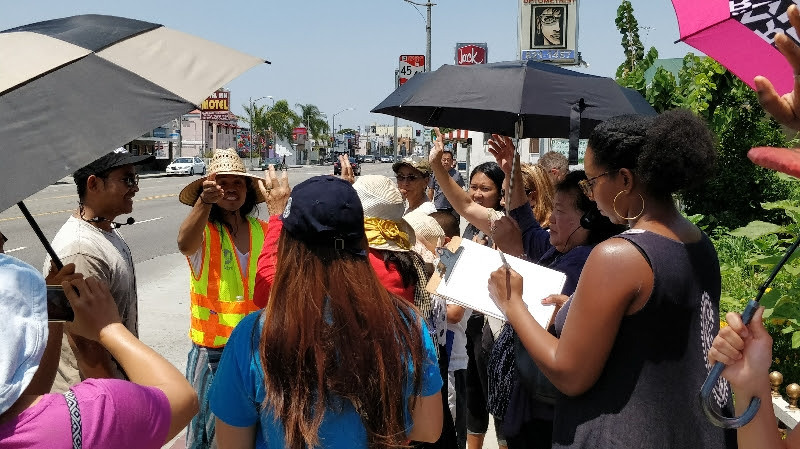 Attendees were given a guided tour starting in Cambodia Town and information on how they could get more involved in making safety improvements in their own communities. In September, the organization partnered with other advocacy groups, including Bikeable Communities, City Fabrick and Walk Long Beach, to bring a Community Pedestrian and Bicycle Safety Training to Admiral Kidd Park in West Long Beach. This was another chance for attendees to learn how to advocate for improved street safety and share their own ideas for improving Long Beach’s walkability and bikeability for seniors, youth, parents, people with disabilities and all other residents. 2017 also marked the first year WBLB assisted in leading Operation Firefly distributions in Long Beach, a bike light program put on by the LACBC where volunteers approach those without lights to give them both front and rear lights, bilingual safety information and a short survey. Following successful events in North and Central Long Beach, WBLB will continue to bring lights to bicyclists in 2018. “We want to also take this opportunity to thank all of the volunteers that have generously given their time to help us make this a successful year and we look forward to continuing the work in 2018 to make our streets safer for everyone,” the release stated. Learn more about Walk Bike Long Beach via its Facebook page here.